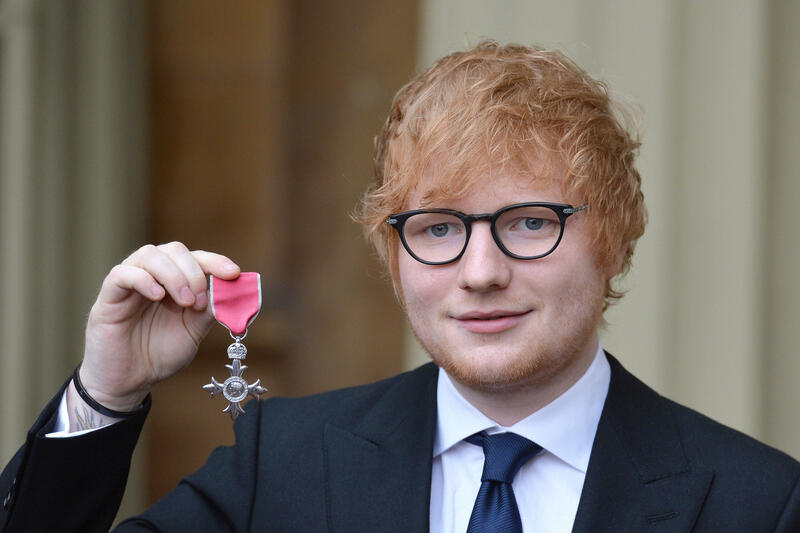 Ed Sheeran became a Member of the Order of the British Empire (MBE) on Thursday, but he made a royal faux pas during the Investiture ceremony: Sheeran touched Prince Charles' arm when he received the honor at Buckingham Palace in London. The singer was awarded his MBE for services to music and charity. Sheeran said on "Today" that he "shook the prince's hand and talked to him for a little bit." Then he confessed, "Apparently, I did a big faux pas, though. I shook his hand and then grabbed it and you're not meant to do that." A photo shows Sheeran touching Charles' arm as he shakes the royal's hand. But the mistake did not overshadow Sheeran's achievement. Clarence House tweeted that Sheeran said, "My grandfather... he died on this day four years ago, so it's actually quite a nice full circle thing, I guess he'd be pretty proud." It might not even have been Sheeran's most controversial royal encounter. In January, he talked about a cut on his right cheek and alluded to rumors that Princess Beatrice had accidentally cut him with a sword while pretending to knight him. "There weren't a lot of people there that night," he said on "The Graham Norton Show." "For two weeks after, I had a huge gash on my face and would tell people I fell and then suddenly, the story came out." Then he corrected himself and said, "The alleged story came out." Sheeran was just named Spotify's most streamed artist of the year. Last week, the singer dropped a new single, "Perfect Duet," with Beyonce.